The CTL houses an extensive pottery type collection of pre-Columbian and historic period aboriginal pottery from Florida and the Southeastern U.S. The Florida materials represent type specimens assembled by Ripley Bullen, John Goggin, and Gordon Willey, pioneers of Florida archaeology. The type collections serve as a primary comparative resource for museum scientists, graduate students, and visiting researchers. View our Image Galleries to see examples of types in our collection. The CTL also curates clay samples from throughout Florida and neighboring areas that document geographic variability in clay mineralogy and chemistry. To date, we have catalogued over 280 samples from 45 Florida counties, 77 from Georgia, and 50 from various other areas of the southeastern United States, the Caribbean, and Central and South America. This collection is being steadily augmented each year through the efforts of FLMNH staff as well as submissions by unaffiliated researchers. Clay samples are processed to make test bars and fired clay briquettes are thin sectioned for comparative analysis. More Information. Want to submit a sample? We welcome new materials. In general, we request approximately one full quart-sized plastic bag of each sample. Please contact us to discuss your submission before mailing your clays. Complete the Submission Form electronically or by hand and return it to us with your clay sample. 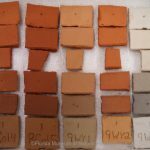 We have established a comparative “library” of pottery and clay sample thin sections, generated primarily from characterization studies conducted here at the CTL. We are developing a comparative database and will become the premier repository for ceramic resource data in Florida and the lower Southeastern United States. 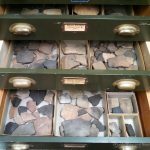 We currently house over 800 thin sections of pottery. Over 400 of this number are from nearly 90 sites in Florida. The remaining thin sections are from the Southeastern United States (n=180), the Caribbean (n=176), Central America (n=42), Michigan (n=6), and Spain (n=3). Coming soon, a pdf list of curated pottery thin sections. We currently have thin sections for only about 30% of our curated clay samples. 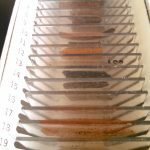 As time and funding permit, we hope to have thin sections made of our entire collection of curated clay samples. Coming soon, a pdf list of curated clay sample thin sections.